You may have seen the YouTube video. You may be reading a doomsayer’s blog. Maybe you watched Armageddon a little too recently. However you heard it, it’s not going to happen. There’s an interesting claim being circulated that an asteroid will hit the Earth tonight. Not only is it not true, the asteroid is going to be so far away (half again as far as the Moon) you won’t even be able to see it (it will be magnitude 10.4)! 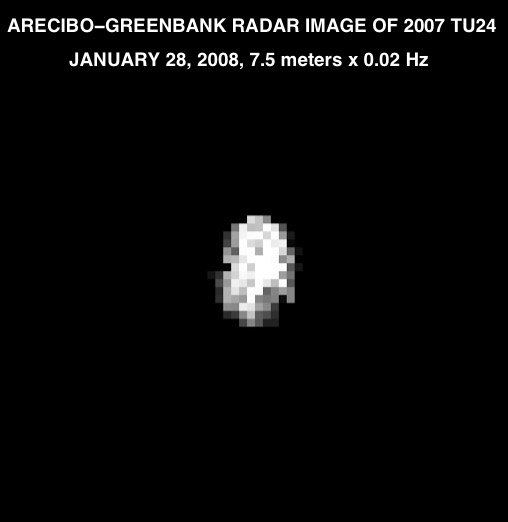 And, if you’re reading this, Near-Earth Asteroid 2007 TU24 (the suspect rock) will have already passed us by, a near disaster averted by orbital mechanics once again. Instead, why don’t you tune in to NASA’s press conference about the MESSENGER Mission to Mercury, or take a look at some of the red-hot, brand new photos from this mysterious hot world? Trust me, the new discoveries being made on Mercury are going to be way more awesome than an asteroid you can’t even see. That’s why there’s no photo with this AstroInfo. I don’t want to mislead those of you skimming this article. So, for today, use your imagination for the asteroid, and go to NASA’s website for some pictures of Mercury. If you want to know more about the asteroid, check out Phil Plait’s commentary from Bad Astronomy.com: or NASA’s press release. You’re smart. Listen to the experts.